Processing and cooking fresh pumpkin to use in later recipes like pumpkin pie, or soup is something I am extremely familiar with. 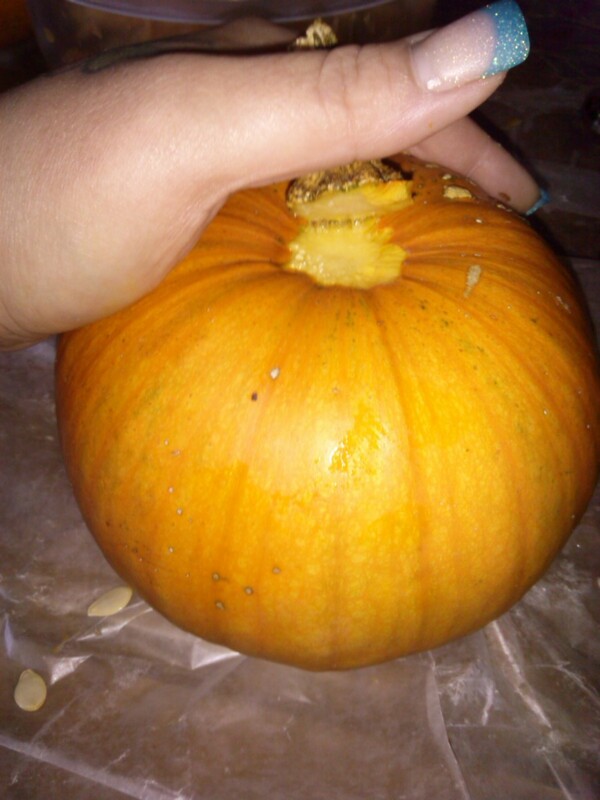 I grow my own sweet sugar pie pumpkins every year to make my homemade pumpkin recipes with. There are many ways to prepare fresh pumpkin for using in pumpkin pie recipes. Though, many take the easy way out and use the microwave. That is not what you will find here. Using a microwave robs pumpkin of all the amazing health benefits, and nutrition that it holds. This is a basic recipe for preparing fresh pumpkins and creating pumpkin puree. Pumpkin puree is the base for many pumpkin related recipes. Everyone's fall favorite pumpkin pie, cannot be made without it. 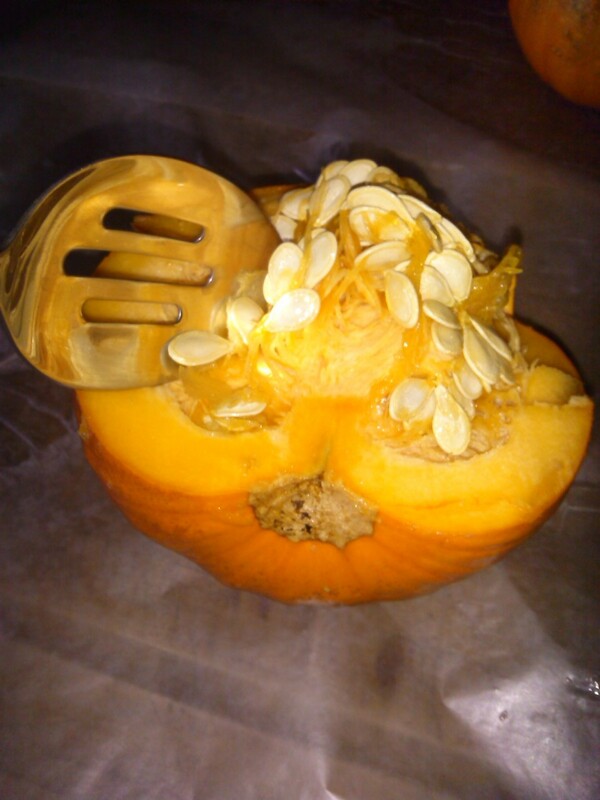 Since I was recently preparing my fresh pumpkins for use in pumpkin pies later, as well as saving my seeds for planting next year, I documented everything. You will no doubt find the instructions for preparing pumpkin puree easy to follow, and not as complicated as you may have thought. Even though sweet sugar pie pumpkins make the best pumpkin pies since they are sweeter than other types of pumkin, you can use any variety you like. 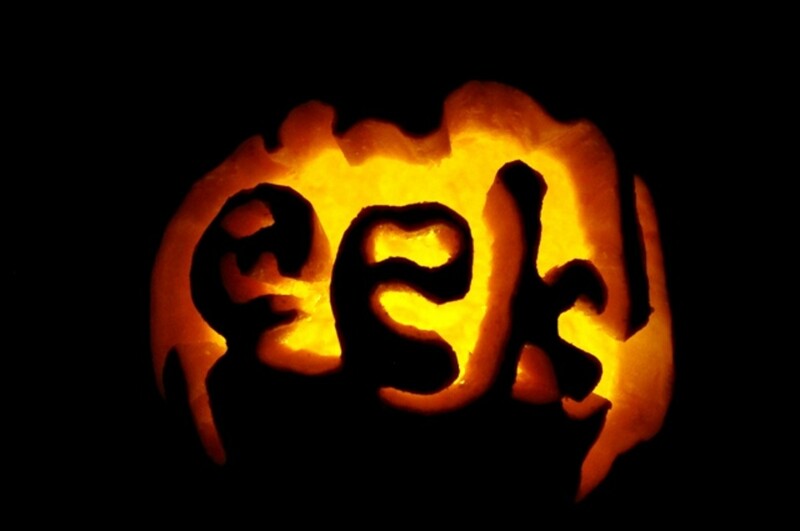 I have made pumpkin pies with Big Mac's, and evn jack-o-lantern pumpkins before. Have you ever used fresh pumpkin in pumpkin pie recipes? Never going to happen, to much work! Yields: 2 lbs puree or more. 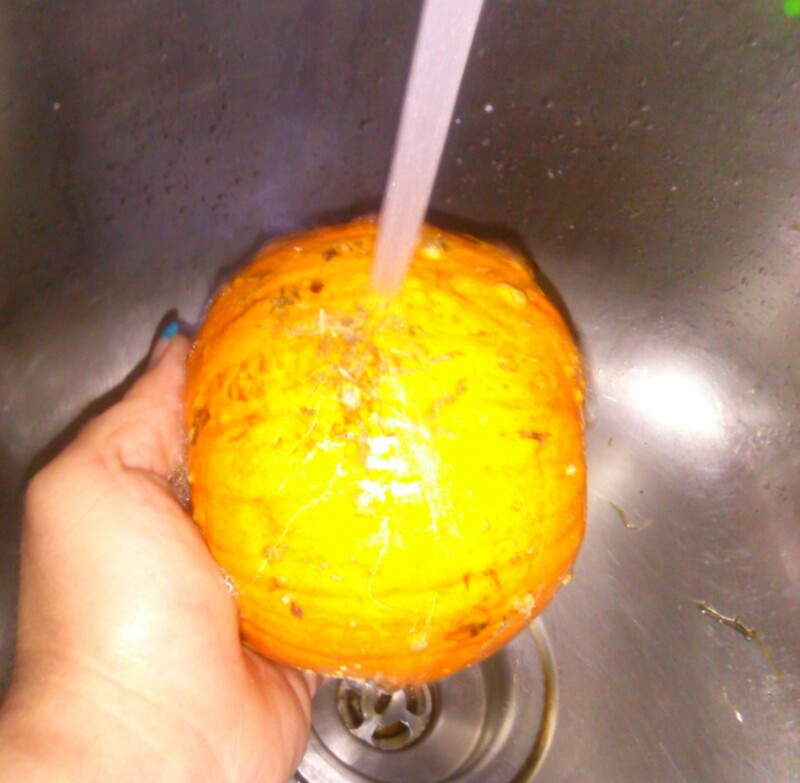 The first step is washing any dirt and debris off the pumpkins under a warm tap. You should not use anything abrasive, just rub your hands over it to loosen any dirt. Should you run into any dirt that seems stubborn you can wipe it with a clean dishrag. Never use a scouring pad, or brush of any sort. I use this Tramontina multi-cooker for preparing pumpkin puree as well as tons of other dishes and recipes. It is professional culinary grade and a huge benefit and time saver for someone like me who spends so much time cooking! I use it for everything to cooking pasta, lobster and seafood, steaming veggies or fish ~ you name it, it can do it all! It also has a wonderful lifetime warranty, something I always look for in culinary tools. Add1 cup water to outer pot. 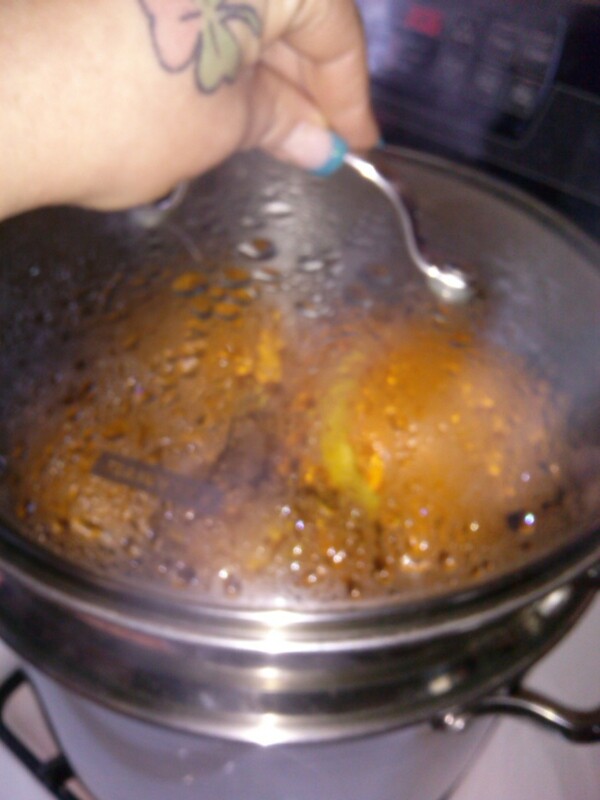 Place steamer basket into pot. Place lid on the steamer. Turn on heat to medium/low setting. It is not necessary to use a large amount of water. You do not want the water level to come into the steaming basket where your pumpkin will be. 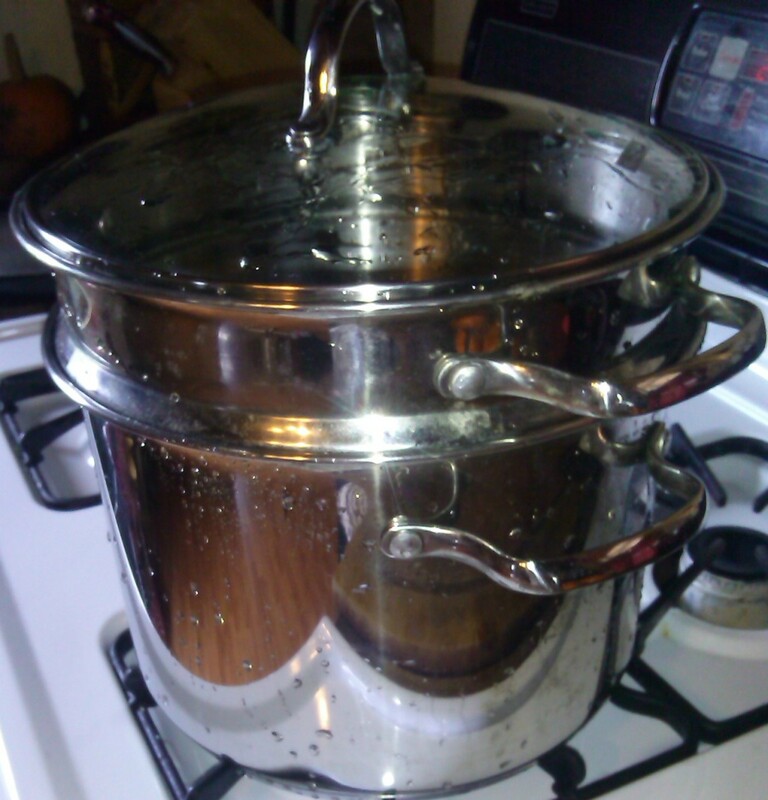 A good steamer pot will retain moisture, and it should not be necessary to add any additional water during the steaming process. You absolutely need a sharp serrated knife for the job ahead. Using a straight edge knife for this is extremely unsafe. 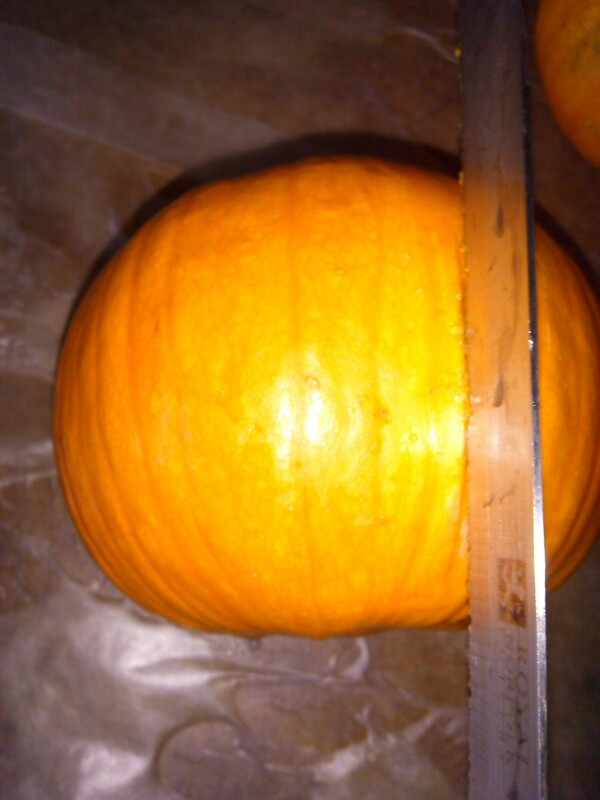 The surface of the pumpkin is very smooth, and extremely hard. Attempting to use a non serrated knife is an accident waiting to happen. 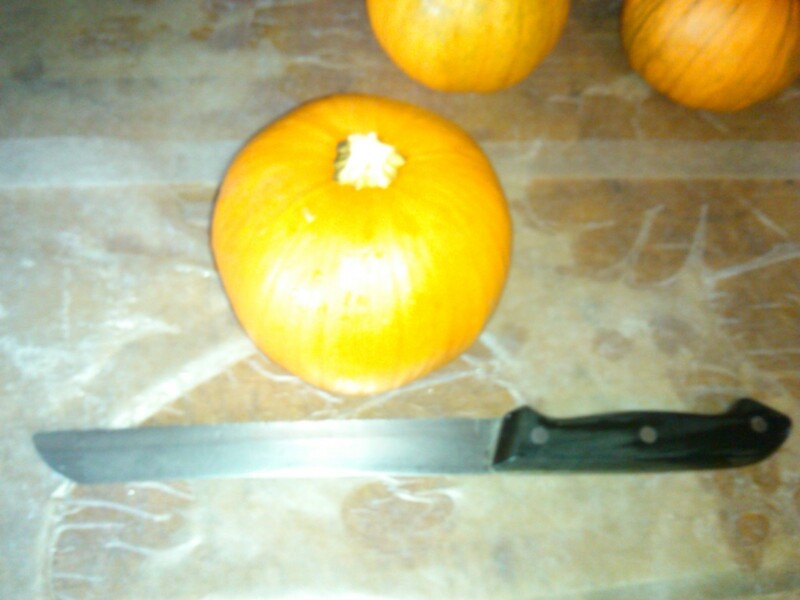 It is much easier to remove the stems prior to cutting the pumpkin. 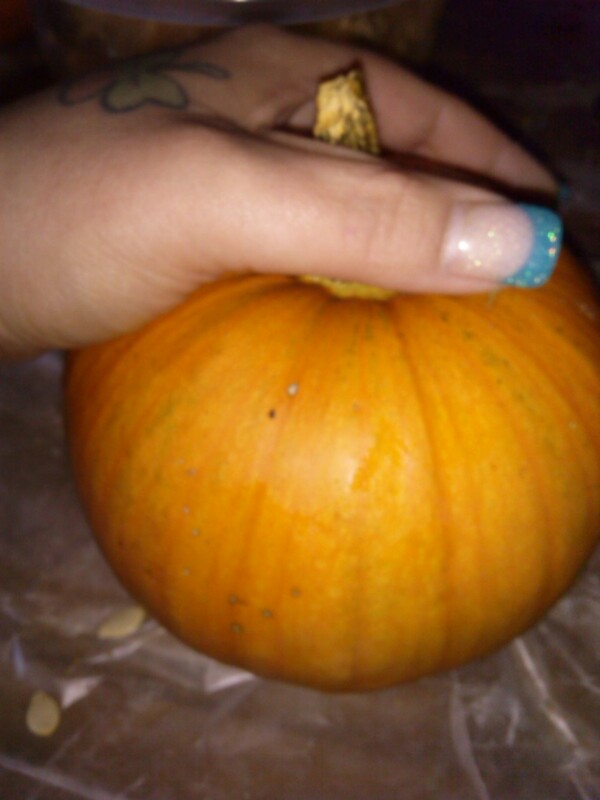 Hold the pumpkin so all your fingers are on one side and your thumb is against the opposite side of the stem (as pictured). Pull back using your thumb, and the stem will easily pop loose. Using your serrated blade score the pumpkin rind, you do not necessarily have to go completely through the flesh of the fruit. 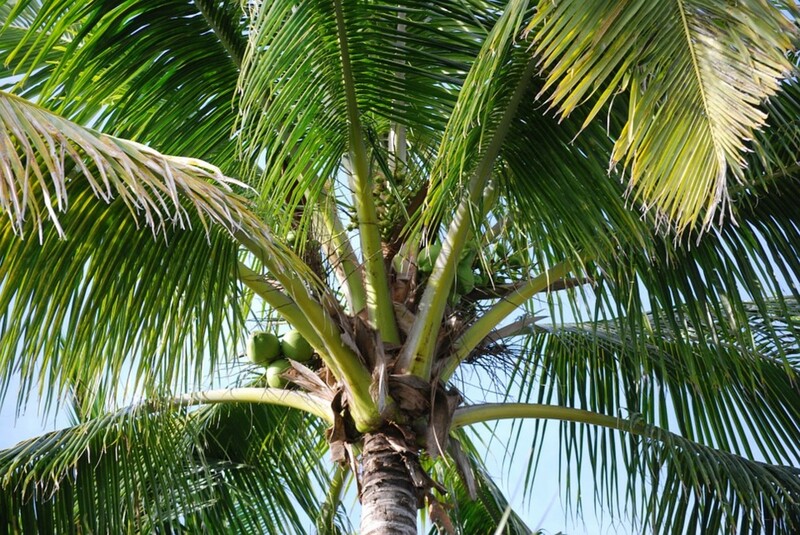 You want to score deep enough that you are into the fruit but not through it. I find it easier to do this on the side, rather than fighting with the stem area, or bottom. Once you have a scored line you can follow the line around the pumpkin connecting the score marks on the opposite side. 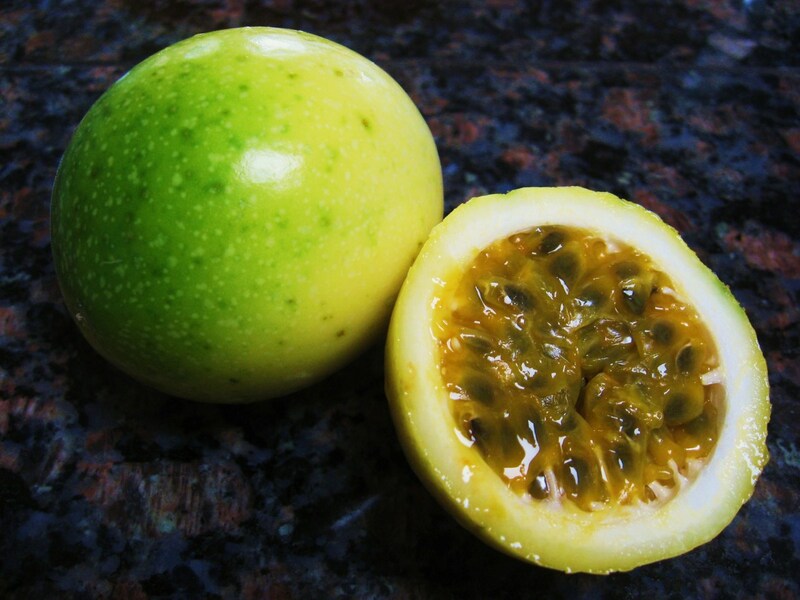 Once you have a score line you can then place your knife onto a score mark and proceed with a sawing motion to cut completely through the fruit. Your fingers should always be tucked in so that if there is any contact being made with the blade it is flat and against the knuckles. I use this inexpensive Farberware melon baller in my home for scooping out pulp, like I do with pumpkins. It works much faster than trying other methods. It also works very well for soft cheese, if you like to entertain there is nothing cuter than mini round balls of cheese as an appetizer. It helps create some very cute edible displays for parties and gatherings as well. After you have cut all the pumpkins in half (or just one, however many you chose to work with), you need to scoop all the seeds and stringy pulp out. There are no fancy tools needed, a spoon will work rather well if that is what you have to work with. I use a melon baller. 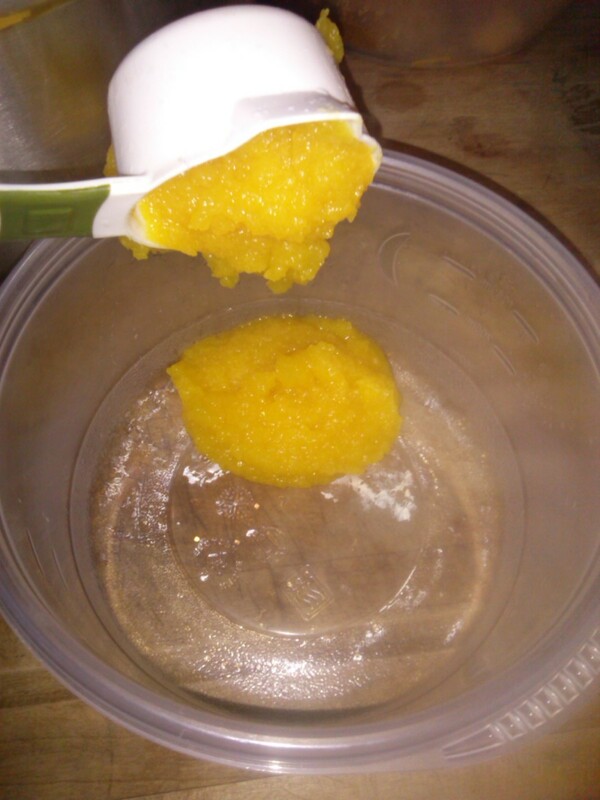 My melon baller is a faster method, since it has slightly sharp edges where a spoons edges are dull. Scoop out all the seeds and pulp and place them into a bowl. 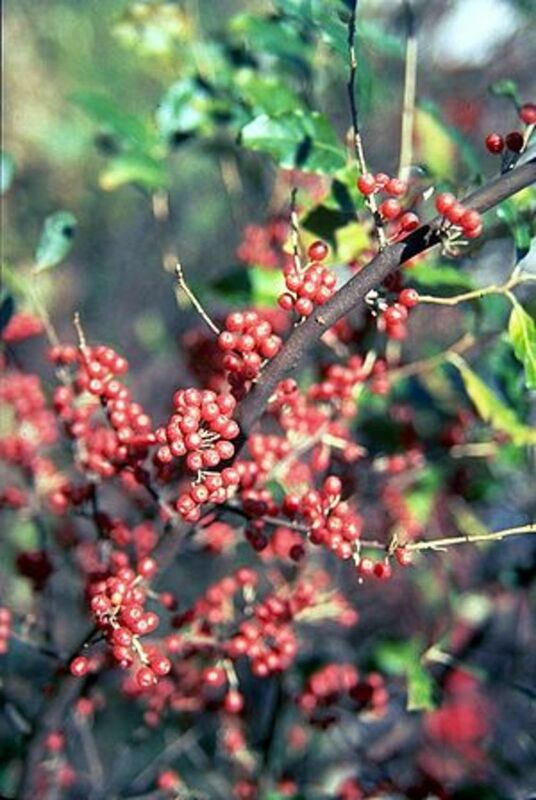 You can save the seeds for roasting later, planting or just add the scraps to your compost bin. You should always put the fruit side down. Keeping the rind facing up as it shown in the photos. This will make for fast steaming! Always put the largest pumpkins on the bottom and then your smallest should be on top. This allows the larger pumpkins to take the brunt of the steam and all the pumpkins should be done at the same time. Otherwise you may end up with the smaller ones over cooked, and the large ones still hard as a rock. 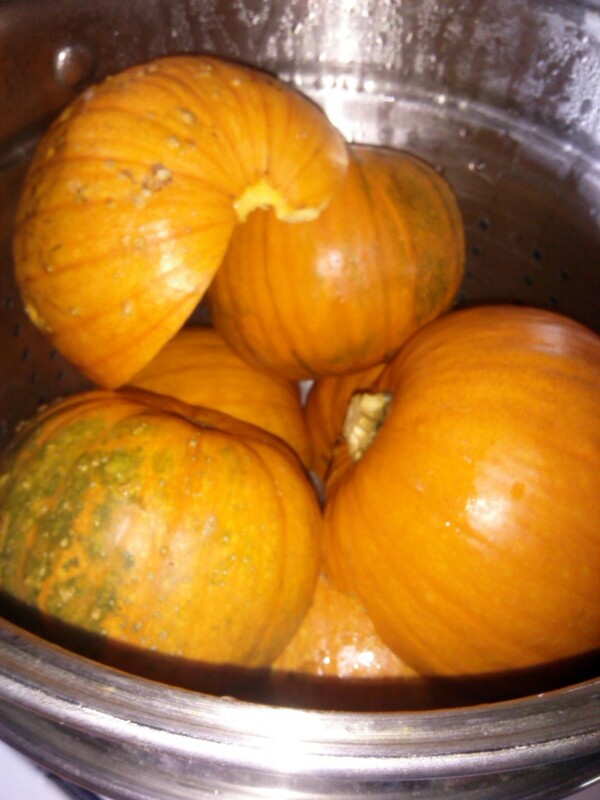 Once you have all the pumpkin halves arranged you can put the lid back on the steamer. Then turn your stove up to high. It will take approximately 15-20 minutes for your pumpkins to be finished. I suggest setting a timer for 15 minutes since many things will factor into the time it takes them to finish. The size of your pumpkins is a huge factor. Once you have hit fifteen minutes take the lid off your pot using caution (it is hot). Poke a rind with a fork. 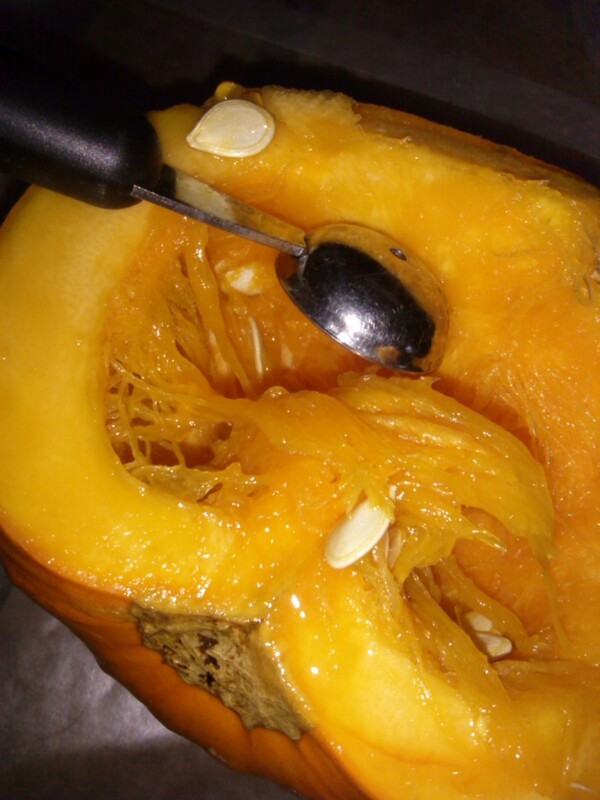 If the fork easily slides in the rind of the pumpkin you are ready to turn the heat off. 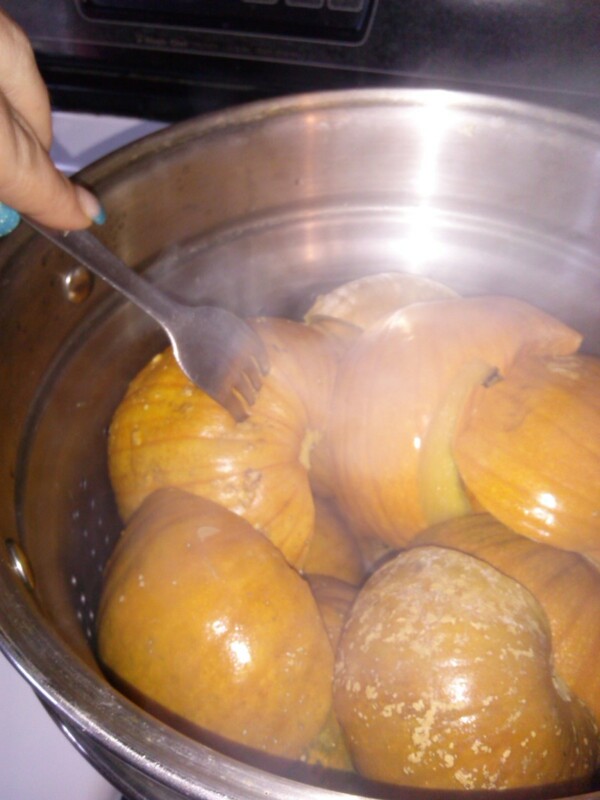 If there is resistance or the pumpkin is stiff, you should continue to steam and check in 5 minute intervals. 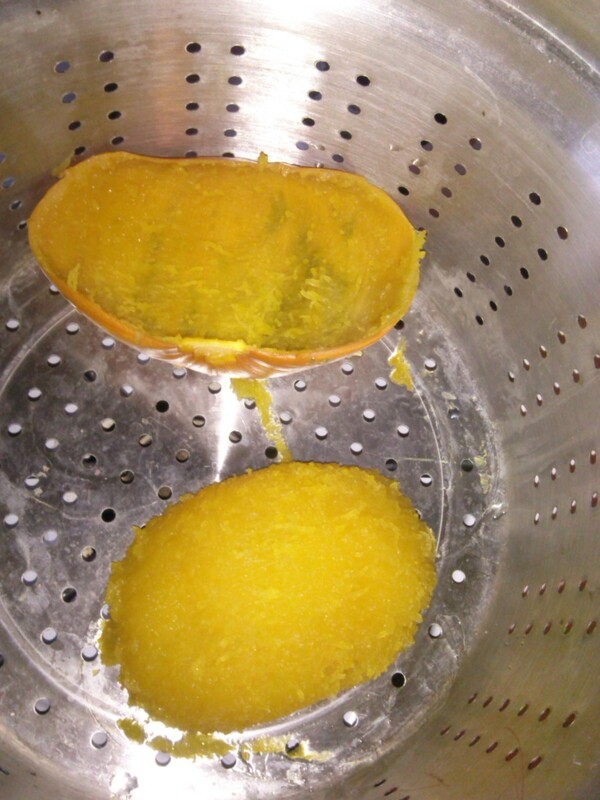 Once your pumpkins are finished steaming, remove the inner steamer from the pot. It is important to work while the pumpkins are still very warm. If you are not used to working with something while it is hot, I suggest some silicone pot holders. 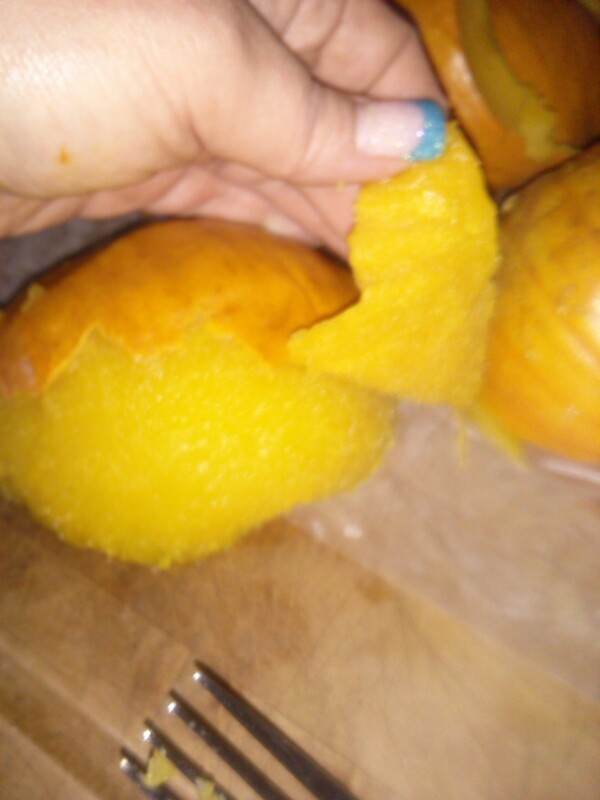 If you allow the pumpkins to cool to much the skin you need to remove, begins to become almost glued on. I use my hands and begin to grab and edge and pull back on the peel, they do come off rather easily. Some even came off in one solid piece when I tried to remove them from the steamer basket. If you do run into some trouble or if they start to cool down too much and one sticks, you can use a fork to help pull the skin loose. 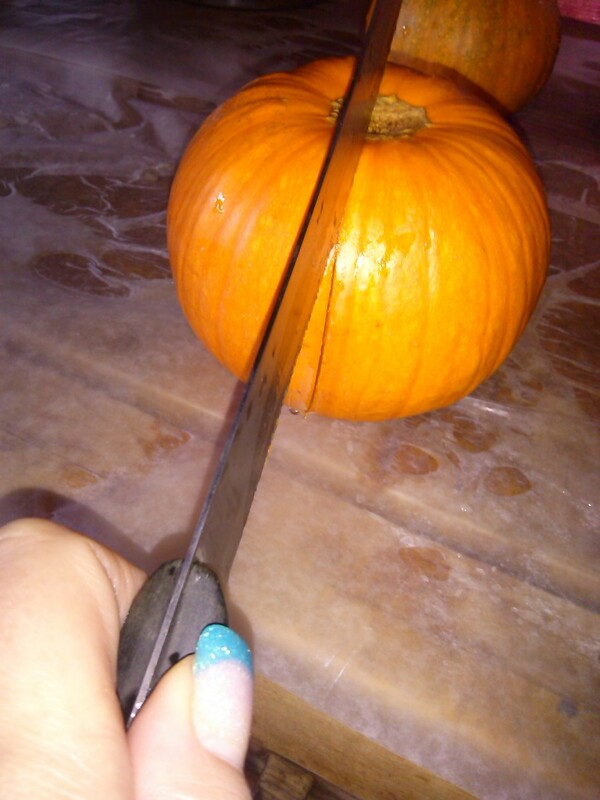 I do not recommend using a knife to help remove the skin since the pumpkin holds a lot of moisture and is slippery. 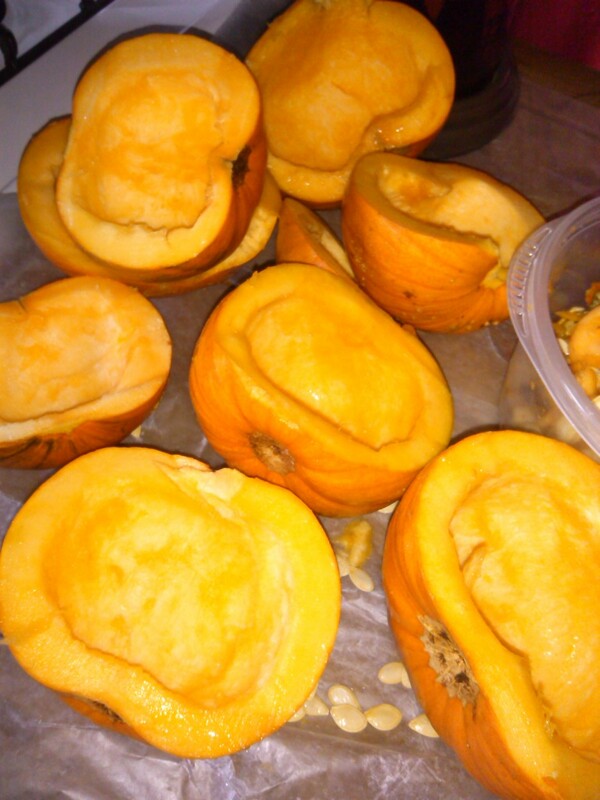 As you remove the skins place the pumpkins into a mixing bowl, and the skins into the scrap bowl. Now that you have removed all the skins you can begin making the finished product! A hand mixer will work just fine, or if you do not have one you can use a blender. 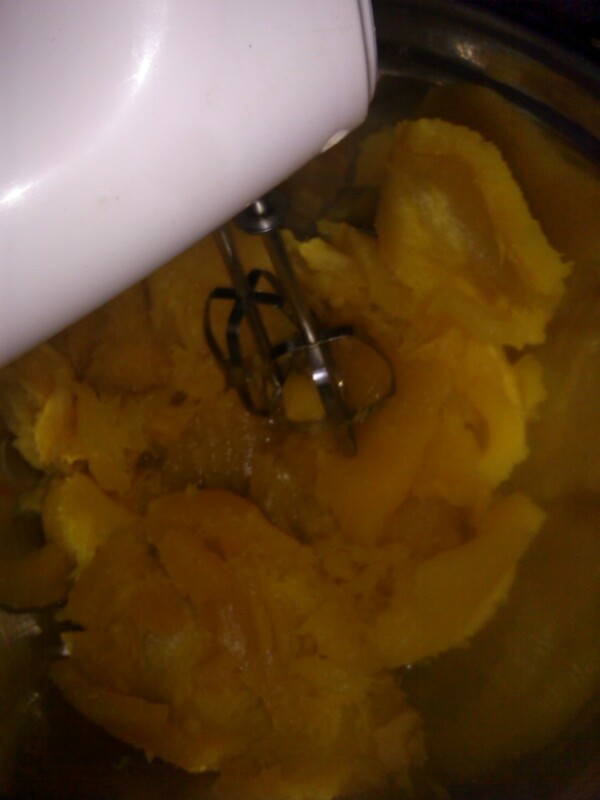 Place your mixer into the pumpkin halves and turn it to high. Continue mixing until you have removed all large chunks. Keep in mind it will still seem fibrous, you do not need a very smooth texture. 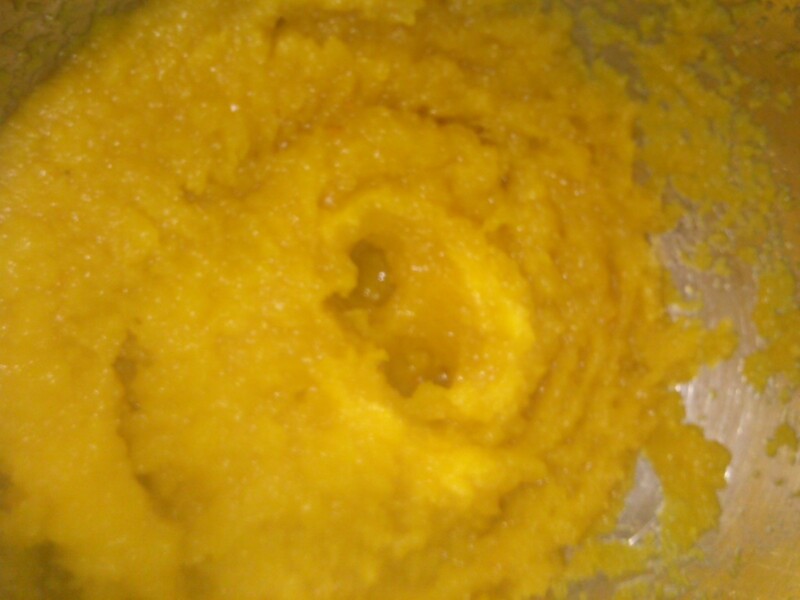 Once all the large chunks have been smoothed into the puree you can turn off the mixer. If you are using a blender, just toss in the chunks until you reach the same outcome. Watch your settings though and go with a 'chop' setting if you have one, otherwise you may end up with pumpkin liquid. 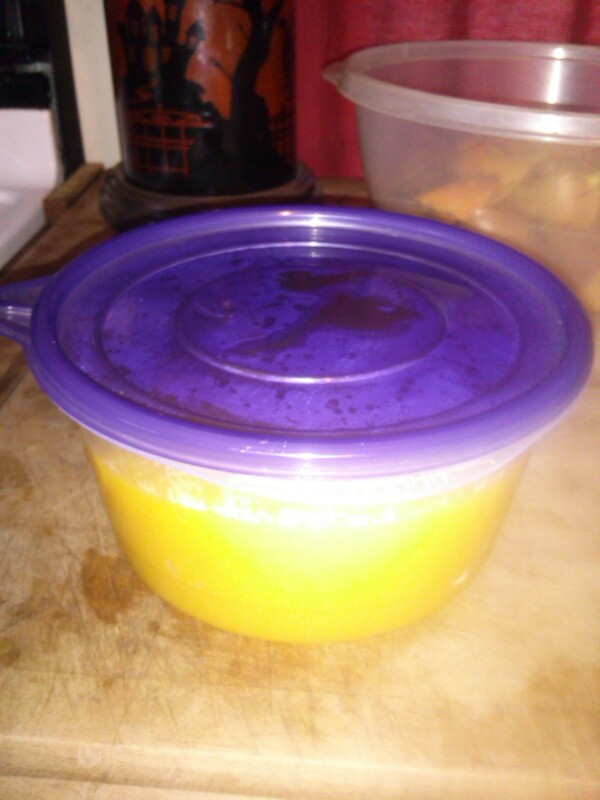 Now that you have finished creating your pumpkin puree to use in pumpkin pies or other recipes, you need to store it. For this particular batch I chose a plastic freezer container, since I know it will not be in there for more than a week or two. If you intend to store longer than a few weeks freezer bags are the best option. You can easily use a measuring cup and store your pumpkin puree in exact measured amounts for the recipes you intend to make with it. Doing so will keep you from thawing more than you need at one time. If you use freezer containers or freezer jars labeling is easy with dissolving labels. For freezer bags I just date, and write what recipe I measured for directly onto the bag.